A lip finish that fuses the creamy, sheen-filled nature of Cremesheen Lipstick with the shine of M∙A∙C Lipglass. Soft, comfortable, non-sticky. I have yet to see these in person, hopefully this coming week, but just from the swatches I've seen, there are plenty of items that I would love to call my own. So far the most interesting items are the cremesheen glasses and the blushes. The cremesheen glasses are going to be permanent at all stores so there is no rush for me to get them. When they came out last year as Limited Edition, I bought Boy Bait and loved it, so I'm super glad they are going to be permanent. 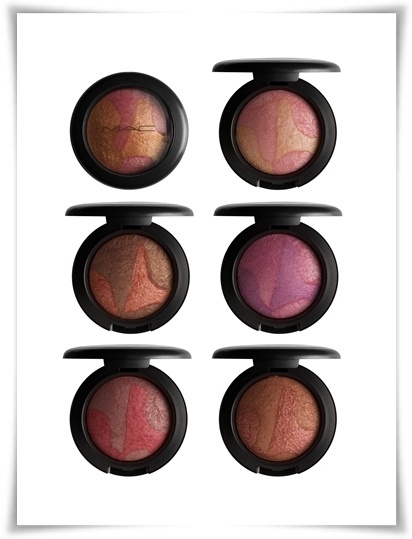 The blushes are a little different from previous duo mineralize blushes. I have yet to test them to see if I really like them. This collection is currently available online at maccosmetics.com and at any MAC counter/store. The Mineralize Blushes look niceeee. I will definitely keep a look out for this collection. =] Thanks for the heads up. I want to check out the l/g for sure! =D Thanks for joining my giveaway, Mary!